It’s rare to find a house that has everything on your wish list, and when we bought ours we knew it was lacking two important items. An entryway and a coat closet. The front door opens right into the living room and it felt a little awkward. So we set up one of our couches to block off the room a bit, defining an entry area, and also making the long, narrow living room a more cozy size. We recently got a piano, so now it’s an entryway/piano area. When you live in a small house, you have to get creative! One of our priorities in creating our entryway was to come up with a place to hang our coats. 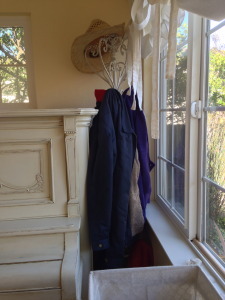 Most of them live in our bedroom closets, but we were able to fit in a small rack, so at least we can hang up whatever coat we’re using for the day. We are last-minute, always-running-late, where-in-the-world-are-my-keys kind of people. So I decided that I would use our improvised entryway as an opportunity to get us more organized. We added a storage shelf with cubbies under the front window. Since we try to go shoeless indoors, shoes go in the bottom cubbies. The top cubbies hold containers with purses, backpacks, hats, and mail that can be dealt with later. On the top of the shelf we have three important baskets. The big one is for my son’s school paperwork. In it, I use jumbo Ziplock bags to keep papers separate. One Ziplock goes on top of the pile, always, and contains any forms to be signed and sent back. 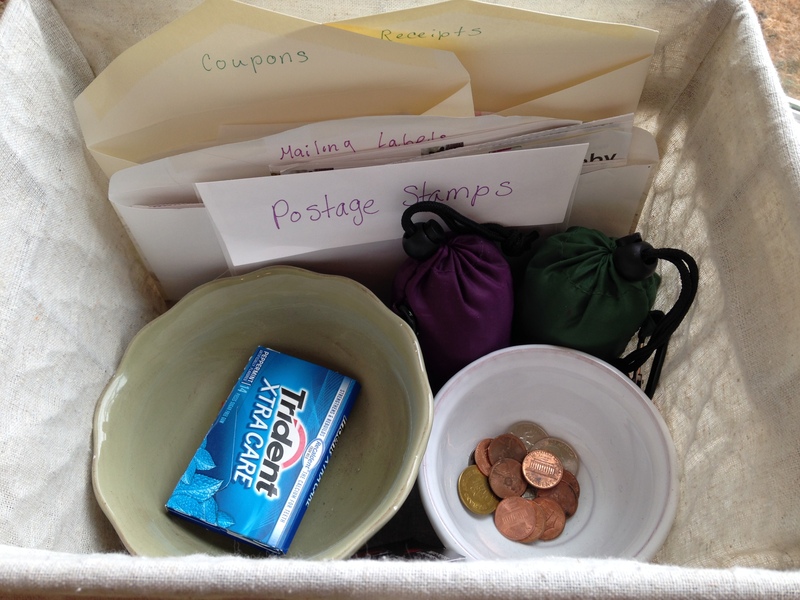 Another Ziplock gives an immediate home to the finished work his teacher sends on Fridays. A third Ziplock is for his activities, such as Little League information. 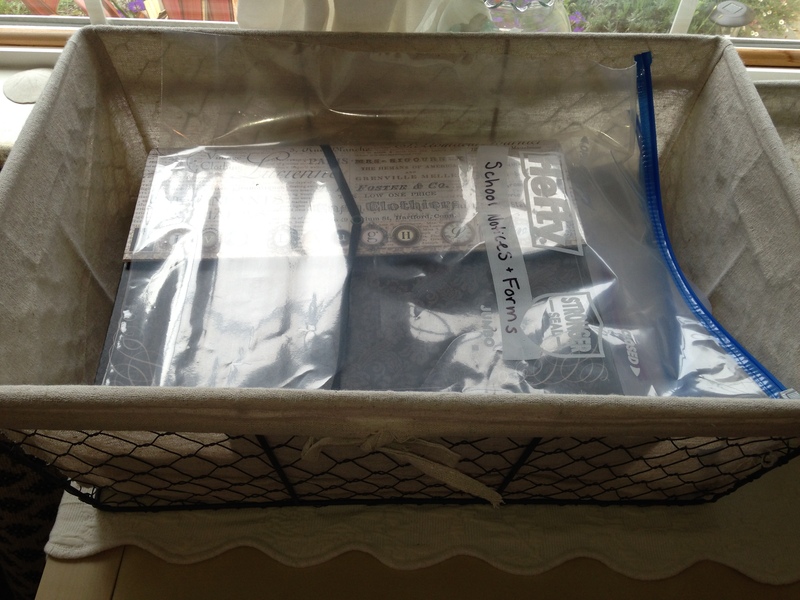 The basket also contains an accordion file for piano music, since we don’t have a traditional piano bench with storage. The middle basket is for the daily mail. 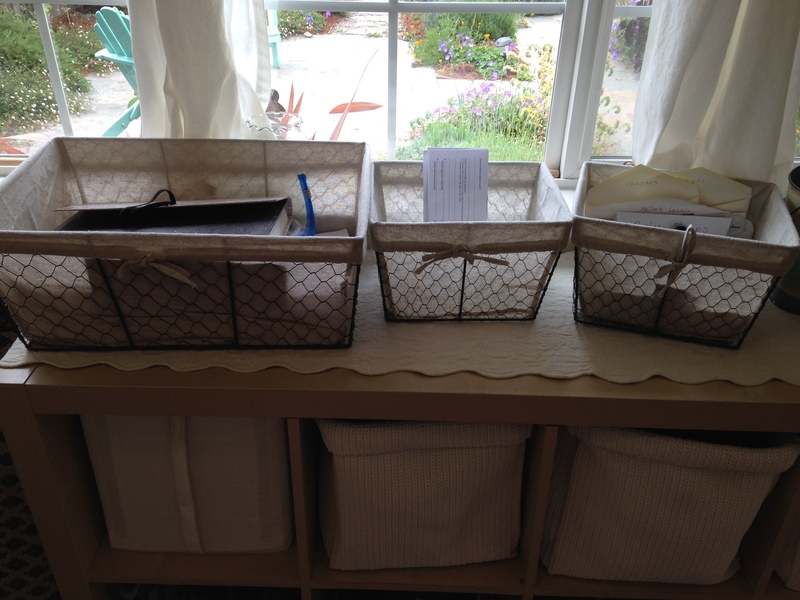 We recycle the junk, leave the urgent items in the middle basket, and add the rest (things we need to file, for example) to the to-be-dealt-with-later container in the cubby down below. The basket closest to the door contains miscellaneous things such as loose change, postage stamps, etc. But even that basket is organized. 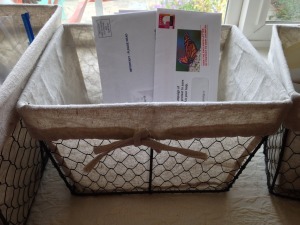 Postage stamps, coupons, mailing labels, and other paper bits all have little files made from envelopes. Change goes in one cup, and random things like gum go in the other. And there is room for small items that need to be taken out to the car, like these little grocery bags. Right by the door we have three containers for essential items. 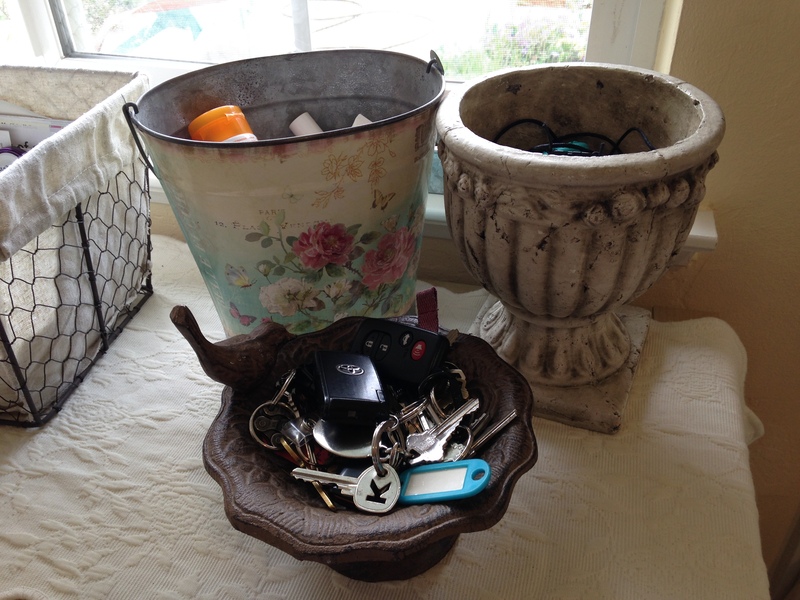 The miniature birdbath holds our keys. The cute floral bucket is for sunscreen. (As a fair-skinned, coastal-living family, we don’t leave home without it, and having it right by the door helps us remember.) And the third container, an old, urn-like flowerpot I got at a flea market, houses my son’s fidget toys. He needs at least one wherever he goes, in order to focus, and he doesn’t remember on his own. Placing them by the door is a good solution. And on the window sill behind all of these practical things? 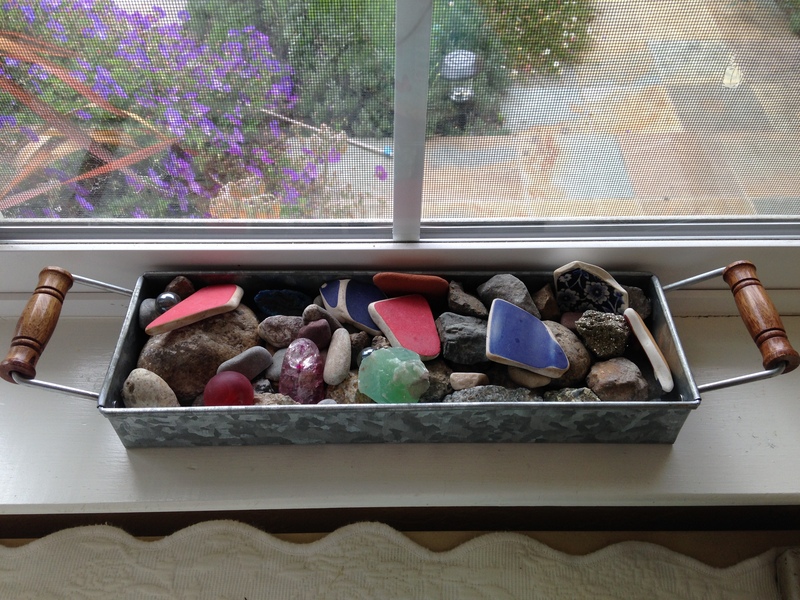 My son started a rock collection there, and it was taking over everything and making me nuts. A small tray was the perfect solution. The shelf is the Kallax from Ikea. It costs $64.99 new, unless you get it in one of the more expensive, high-gloss finishes. And I encourage you to look for it on Craig’s List. It is popular and you might find it used, for a very cheap price. The four white containers in the cubbies are also from Ikea. They don’t carry them anymore, but it looks like you can get something similar from $6 – $15 each. The coat rack was from Amazon and it was about $90, but they don’t have it anymore. I’m sure you can find something similar there, or at Walmart, or on a home decor website. But please heed my cautionary tale. Our rack came in pieces that screw together. It seemed fine at first, but now it’s gotten tippy and doesn’t screw together well. I would consider just putting a few nice looking hooks in the walls. I’ll be joining you in that project, if my coatrack falls over on me one more time! The baskets were on sale at Cost Plus. They still have them at full price, or consider joining their mailing list and waiting for a sale or coupon. The tray for the rock collection was on sale at Pottery Barn. It comes with little buckets to house silverware at a picnic. It’s marked down right now. The birdbath, urn, white shelf runner and bucket are all flea market finds, or super-cheap, clearance-rack type of things. Each cost less than five dollars. And the piano was free, from Craig’s List. Refinishing it was quite an adventure. Here is a past blog post about it. Sometimes friends come over and peer at my entryway organization system and go home with ideas that might be helpful at their house. I hope you feel the same way after reading this. And please feel free to share your own tips for an organized entryway in the comments. Great post. I have done some similar stuff in my front entryway. I put a long shelf with hooks underneath to hold coats, jackets, umbrellas, grocery bags and the dog’s leash. I also have a cabinet with four drawers. One drawer is for keys, one is for eyeglasses and sunglasses (basically the things we were forever searching for, as in, “where the heck did I leave my keys?” Now that they have a home, it’s not such a problem anymore. Other things that are always getting lost also have a home in this cabinet. Love your ideas and your home looks very warm and cozy. I’m very intrigued by the idea of a shelf with hooks. I’d have never thought about that. I’d love to see a photo of it. And drawers for those essential items would be great because then we wouldn’t be looking at them all the time. Sunglasses are a problem… I don’t have a spot for them in my system. I keep the cases in my bin with my purses and put mine in there, but my husband either leaves his in one of the baskets, or leaves them in the car, or wanders around saying “have you seen my sunglasses?” 😉 Thanks so much for commenting on my post today!!!! Claire, I’m truly inspired. 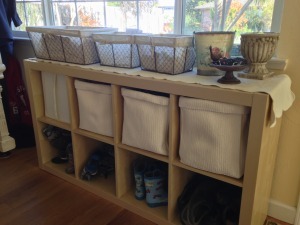 The shoes in the cubby shelf — when next I get a house, I’m going to try that! It’s smart. I didn’t even see the shelf until you mentioned it, then I scrolled back up. I saw the piano right away though, it’s beautiful!! Love it. Also love the couch and your placement of it (tip for birthday party some time (or random party): move the shoe shelf over or bring another chair or something over so you have a box behind the couch, in front of the window, then fill that “box” with balloons — SO fun. Not just for kids to sit under them but for adults too. I did that with a small behind-couch space once similar to this. The baskets are really tidy too. My baskets never seem to stay as tidy as your look in this picture, but I’m inspired to give it another try. Now we’ll see how I do with one gypsy caravan of space. Organization will be enforced, I think!! Owning less will make it easier I hope. Thank you for writing this post. I am really looking forward to the next one. Hi Christa, I love the balloon idea. That is so creative!! I would never have thought of that. And I’m glad you like the piano. That was a scary refinishing project because I kept thinking about how much history the piano had, and how many people had probably loved it, or learned to play on it. But in the end I was so glad I did it because now it fits in with our house. I hope you are planning to blog about your life in the caravan! I can’t wait to hear about your adventures. I’m sure getting and staying organized will be a challenge, but with less stuff it will be way easier. Thanks so much for checking out the post! Great idea! I had some baskets once, but never in a neat cubby like this. And never this coordinated. Looks great. Thank you, Marlene. I think in a small space it helps to coordinate some of the items, though I also like some quirky variety. But what I’ve learned is that too much quirky variety makes the house seem smaller, so it’s a fine line! Great ideas, Claire! 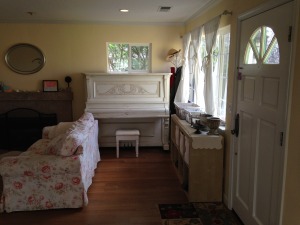 Your entryway and living room are lovely!!! Thank you so much, Mary! I really appreciate you visiting my blog! !